The upcoming Christmas season is the perfect excuse for me to start trying out some delicious dessert recipes. This weekend was also a friends birthday, so I knew I had to make a Christmas Trifle to bring along to the party. I figured it would make a good practice run and I was pretty confident my friends wouldn’t mind doing some taste testing. Judging from the warm reception the desserts received at the party, the Christmas Trifle will be making an appearance at the festive table this year. The idea for the Christmas Trifle came from the new Thermomix Festive Cookbook. I attended the Thermomix Festive Cooking Class in Coffs Harbour and although we didn’t make this recipe in the class, it caught my eye as I flicked through the it. Don’t worry if you don’t have a Thermomix because this Christmas Trifle is just as quick and easily to make by hand. I have given the traditional cooking method for this recipe so no Thermomix is needed. I did make the dessert initially in the Thermomix but I found two components in the recipe left a little to be desired. You will be pleased to know I have altered these in this recipe. If you do buy the Festive Cookbook I would urge you to ignore the ingredients and instructions for the mascarpone layer in the book. Just use my ingredients and instructions here for a foolproof recipe. 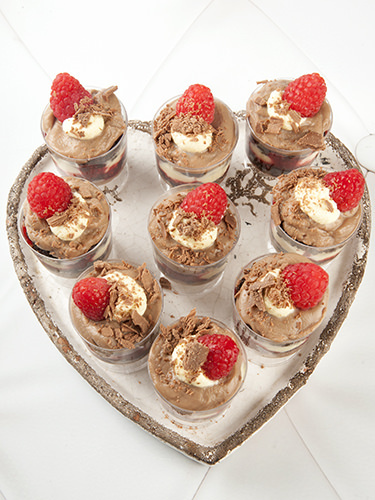 Other than than this alteration it is a fabulous Chocolate Brownie Christmas Trifle. 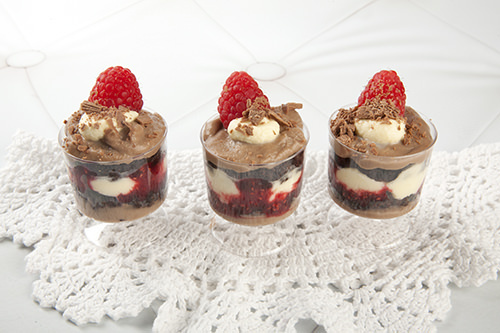 Would you like to know about the different layers of this trifle? We have a layer of deliciously moist, dense, chocolate-y brownie. 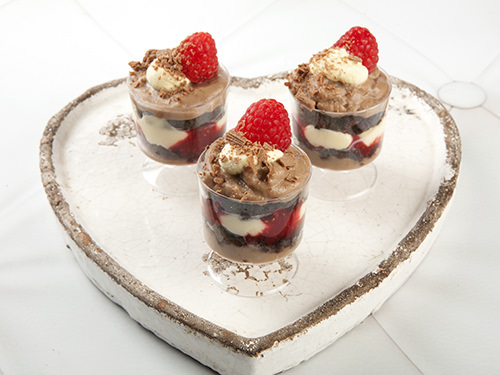 A layer of sweet raspberry coulis, a delicious Chantilly mascarpone layer and a milk chocolate custard. 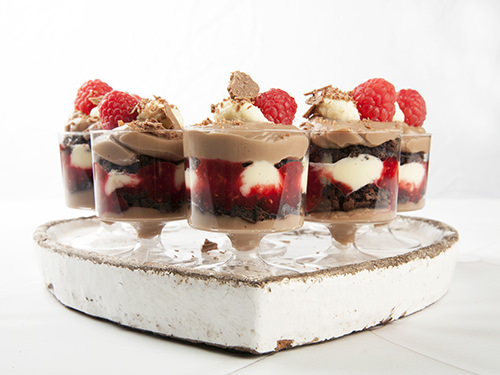 I have decorated the trifle with more mascarpone, fresh raspberries and flaked milk chocolate. The original recipe show the trifle made in one large trifle bowl but I like these neat little individual serves. I think sometimes trifle in a large bowl can lose some of the glamour you want in a dessert. Prepare two 20cm brownie trays by lining with baking paper. Melt butter and chocolate in a saucepan over a low heat. Stir until smooth. Remove from the heat and add the sugar and cocoa, stir until combined. Stir through the flour, vanilla, baking powder then the eggs. Once the batter is combined pour 1/2 the mixture into each of the prepared tray. Bake for approximately 45mins depending on your oven. Remove the brownies from the oven when the batter appears firm in the middle. Cool brownies in the tray and cut when cool. Place all the ingredient into a saucepan and heat on a low setting. Use a stick blender to reduce the raspberries to a puree. Continue to cook the sauce until the sauce has slightly thickened. Remove from the heat and refrigerate until needed. Combine the reserved milk and the cornflour in a cup and stir until smooth. When the milk is just under boiling point add the cornflour milk and stir until thickened. Break the chocolate into squares and add them to the chocolate. Stir through the chocolate until it is melted. Combine all the ingredients in a bowl and refrigerate until needed. Use a cookie cutter to cut circles the same size as the serving cups. Split the rounds into two thinner circles. Place the mascarpone layer into a piping bag. Place the cooled chocolate custard into a piping bag. Place the cooled raspberry coulis into a piping bag. Pipe a layer of chocolate custard into the bottom of the cups. Press a brownie circle into the cups. 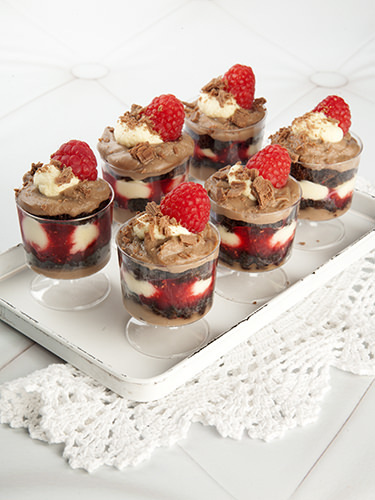 Add a layer of raspberry coulis to the cups. Add 4 dots of Chantilly mascarpone to the layers. Top with another round of chocolate brownie. Cover the chocolate brownie with more chocolate custard. Put a generous squeeze of Chantilly mascarpone on top and add a fresh raspberry to the top. Sprinkle chocolate flake over the Christmas Trifle for decoration. 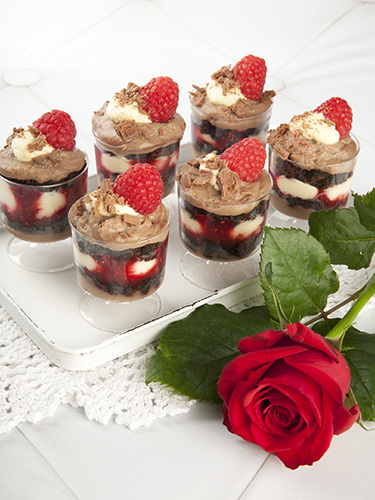 I took these little mini trifles to my friends party and I think they were a success. The recipe made about 30 serves and they disappeared in a flash! I noticed that a few people even went back for seconds and that always puts a smile on my face. I think this would be a particularly good recipe to have up your sleeve for Christmas. The components can be made well ahead of time and stored in disposable piping bags ready for assembly. Have you started thinking about what dishes you will be serving for Christmas this year? Is a Christmas trifle a usual dessert in your family?